My intention was to combine John Carpenter’s Halloween and the sequel Halloween II into one “epic” (using that term loosely, lol) film. Only a few small edits were made to the original Halloween (which is a classic), but a lot of changes had to be made to Halloween II in order to get it to “fit” with the original film. This is because a lot of things in the sequel contradict not only the original film, but what happens in the sequel itself. Namely, the beginning of the theatrical version of Halloween II has many mistakes. For example, when Myers goes into the old woman’s house there’s a report on the news that the police have discovered three bodies in the home across from Tommy Doyle’s house. However, they have not been found at that time. It is not until much later in the film that these bodies are located and Sheriff Brackett finds out his daughter is dead. This sequence of events has been corrected in Halloween: The Night That Never Ends. Also, several unnecessary scenes included in the theatrical version of Halloween II (to extend its length) are not included here. 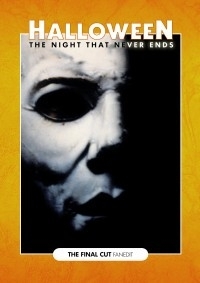 This includes Michael Myers murdering a girl unrelated to the story, as well as Dr. Loomis and the cops acting like buffoons causing the death of Ben Traimer who gets run over by a cop and burned up. Then, Loomis and the cops spend half the picture trying to figure out whether the burned up Ben Traimer is really Myers, which doesn’t work, because the audience already knows the answer. These scenes have been removed to make the entire “epic” flow smoothly and more realistically, keeping the film centered on Myers quest to locate and kill Laurie Strode. We rarely see Myers’ view of the action, until he overhears a news broadcast detailing Laurie’s location at the Haddonfield Memorial Clinic. From then on it’s a slaughterhouse as Myers dispatches (nearly) the entire hospital staff. This was an excellent edit. Combining both worked great. I didnt notice much missing scenes. I just wish their was a SL version. You edited the original Halloween really well. I didn’t even notice that scenes were cut out. However, I can’t say the same when we get to Halloween II. So much is trimmed and the result is so rushed, that I wondered what the point was of seeing scenes from Halloween II. Another thing I thought was just plain disappointing was the score. You should have used the same piano score from the original for Halloween II. It didn’t feel like the same movie with the heavy synth score.